I’ve always disliked The West Wing, primarily because it peddles the myth of brave and decent politicians, always doing the right thing in difficult circumstances. In reality I suspect the public prefer not to think about the dirty deals and corrupt and seedy goings on behind closed doors, which makes The Thick of It more my cup of tea – maybe that’s the UK/US divide? Of course I’m not saying most politicians don’t enter the fray with the best of intentions, but they universally seem to disappoint and the longer they hang around, the more they disappoint. Power corrupts. Even the scent of power corrupts. 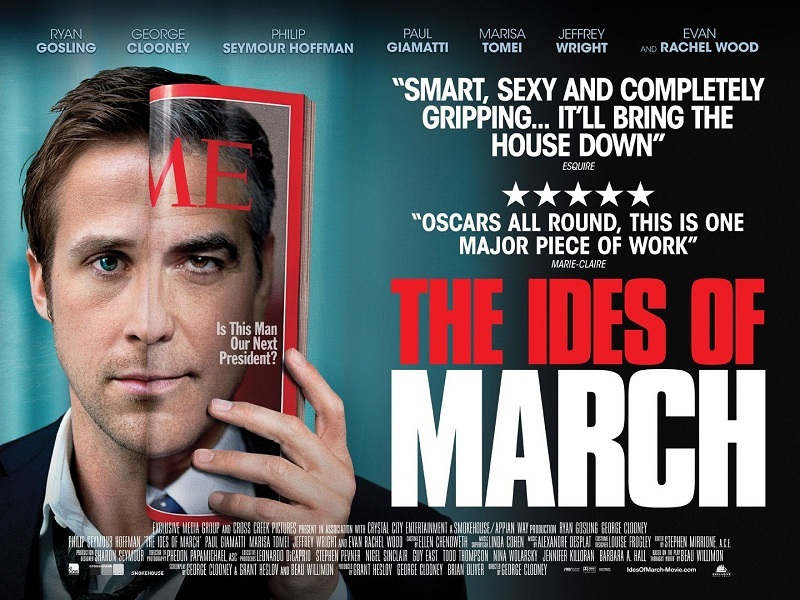 So full marks to Ides of March for telling the down and dirty, shabby story of how politics always seems to turn out. 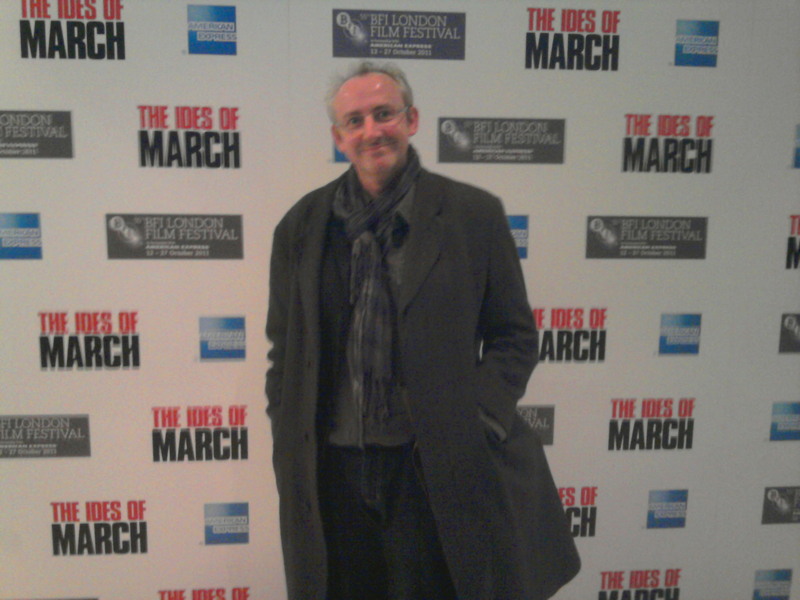 Last Wednesday I joined George Clooney, Philip Seymour Hoffman and Evan Rachel Wood on the red carpet for the UK premier. To really appreciate a movie, I try to read as little as I can about it beforehand, so I can watch at face value. Because of that I can admit my ignorance by believing we were likely to have some kind of retelling of the Julius Caesar story (by coincidence the play I studied for my O level Shakespeare), so I entered the Odeon Leicester Square confident of making the necessary connections between the film and the Bard. Not a bit of it. The bfi (the British Film Institute in official lower-case letters) is a great institution and a former employer of mine, but their organization often leaves a lot to be desired. I ended up being sent to various spots around central London to collect my tickets, meaning I only reached the red carpet about one minute before curtain up. 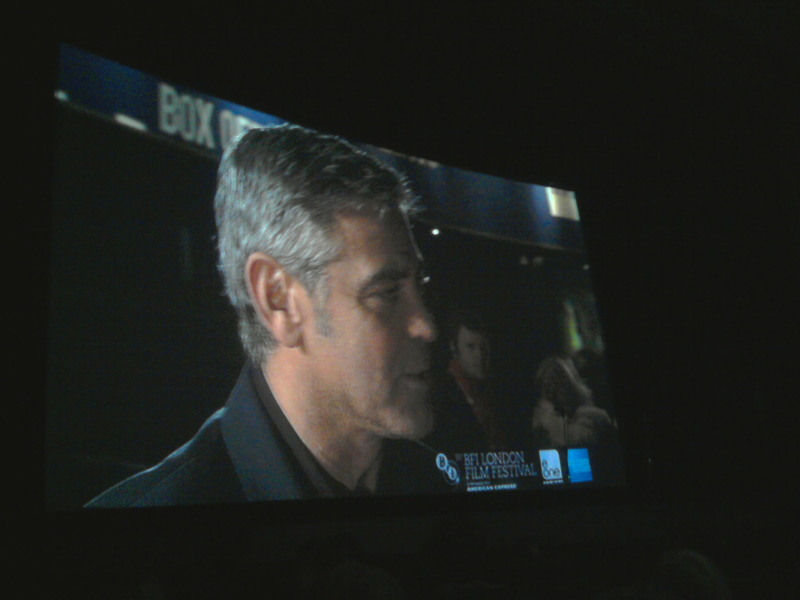 I ran past George Clooney being interviewed without noticing, sat down in my seat and then saw the whole shebang being projected on the cinema screen. As part of the bfi London Film Festival, my old colleague Sandra Hebron (it’s her last year as Artistic Director of the LFF) called Clooney up on stage where he proceeded to share a few jokes and introduce various cast and crew. Then the curtains parted and we were treated to 101 minutes of an intriguing thriller, even if the expected links to Shakespeare were missing. This is the fourth film Clooney’s directed. In front of the camera he plays Democratic presidential candidate Mike Morris, Governor of Pennsylvania and leader in a two-horse race with a Senator from Arkansas. What I loved about the movie was that it’s not The West Wing – it shows just how sordid the realpolitik can be, and all credit to Clooney he’s right at the heart of it. The Ides of March of the title refers to the date of the key Ohio primary, which will fall on 15th March and help decide the contest. The US Primary system has always seemed flawed to me because (in my doubtless limited understanding) it seems anyone can get to vote to decide the preferred candidate. All well and good if it’s only people supporting the party concerned, as they have an honest interest, but I’ve always thought the other party (in this case the Republicans) should rally their voters to support the weakest opposing (in this case the Democrat) candidate. That’s what’s happening in Ideas of March, and it’s embraced by Paul Giamatti’s Tom Duffy who’s campaign manager for the underdog from Arkansas because he thinks it could win them the White House. Morris’s campaign team is led by the always-brilliant Philip Seymour Hoffman as Paul Zara, working alongside second-in-command Ryan Gosling’s Stephen Meyers. There’s also intern Evan Rachel Wood as Molly Stearns. Her dad is leader of the Democrat National Council so she has all the right connections to land a temporary job in the campaign office. In the main the movie follow Gosling’s Meyers in a magnificent performance. His (and our) knowledge of what’s going on around him is limited and he has to act as he sees best given the circumstances he finds himself in. The best of the screenplay is the flirting between Gosling and Wood, and Clooney’s West Wing-esque campaign interviews and speeches. I bet there are plenty of real-life Democrats wishing they had screenwriter Beau Willimon as a speech writer. When you’ve grow up with the sickening bullying spin doctoring of real-life Alistair Campbell or his celluloid double Malcolm Tucker, you get the feeling Zara should have been far more on top of things and people than appears to be the case, which is one of the weaknesses of the movie, and much hinges on a meeting between Meyers and Duffy that seemed very innocuous to me. But if you can get over those two creaks in the story the rest of the film unfolds to give a real humdinger of a thriller and one of the must-see movies of the year. ~ by keithmansfield on October 23, 2011.